At Sony’s Electronic Entertainment Expo (E3) press conference on Monday they revealed a bunch of new games. Unlike EA, it appears most of their new software is coming soon, with release dates in tow. 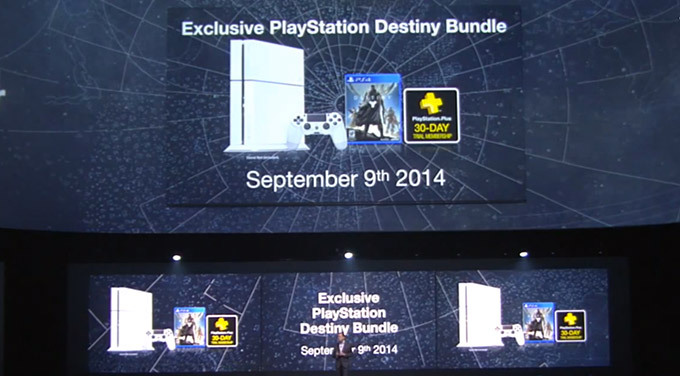 One of those new software offerings is the highly anticipated Destiny for PS4. Sony kicked off their press event with a Destiny trailer that was shown on a screen the width of the Los Angeles Memorial Sports Arena. Bungie’s Destiny is another title that was first announced at last years E3 event without an actual release date. The studio, that was instrumental in the earlier versions of Microsoft smash hit Halo, has pegged the official release date for September 9, 2014 on PS4 and PS3. They’re also opening up beta access to the game beginning July 17th. Bungie is giving a bunch of exclusive content to it’s PS4 version. With that in mind Sony Computer Entertainment President and Group CEO Andrew House announced that they will be releasing an exciting Destiny bundle on launch day. In addition to the game and it’s exclusive Playstation content, the bundle will include a 500gb white PS4 console, a white PS4 dual shock controller and 30 days free access to PSN. No word on whether the white PS4 will be available in any other configuration, so if you’re holding out for a white console this may be the ticket.